A shocking news came to the citizens of Bunawan town in Agusan del Sur. Their town's most popular resident died on January 10, 2013 at 8 in the evening. 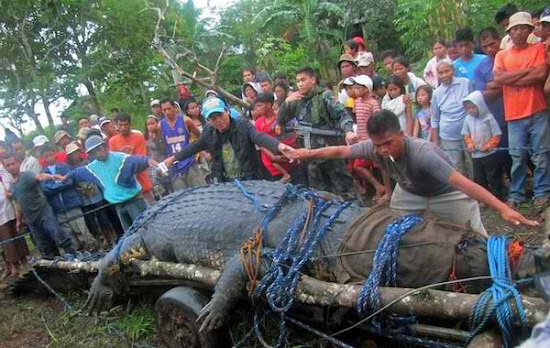 The death of Lolong, the giant buwaya, is not yet known. Ronnie Sumiller, Lolong's caretaker will do the autopsy to see the buwaya's cause of death. Bunawan mayor, Edwin Elorde was there to witness the death of the giant crocodile. Alexander Collantes, a vetirinarian from Davao Crocodile Farm, did his best to save Lolong but it was too late. According to Rowena Elorde, special spokeperson of Bunawan Municipal Government, Lolong swallowed a nylon cord. This caused chronic diarrhea and made the crocodiles stomach to swell. It was not said where Lolong got the nylon cord or who is responsible for negligence. It was expected that “animal rights” group will protest the death of Lolong. Lolong was captured on September 2011 and was named after the crocodile hunter Ernesto “Lolong” Coñate. Lolong was declared by Guiness Book of World Records as the longest crocodile in captivity last 2012. He dethroned Australia's Cassius. The death of Lolong, the giant buwaya, means that Australia's Cassius will regain his spot as the biggest saltwater crocodile in captivity. Information for this post came from Philippine Star and Herald Sun. no wonder why the biggest crocodile was in the philippines, however, they caught the wrong crocodile..A lot of crocodile still roaming around the Philippine government..Hope to catch them too.. Correct. Somebody had become negligent. Lolong is already in a bad shape because he is away from his natural habitat. I kind of expect that Lolong will die soon. Correct. Those buwaya will be found in Malakanyang, Congress, city halls and even barangay halls. They are everywhere.